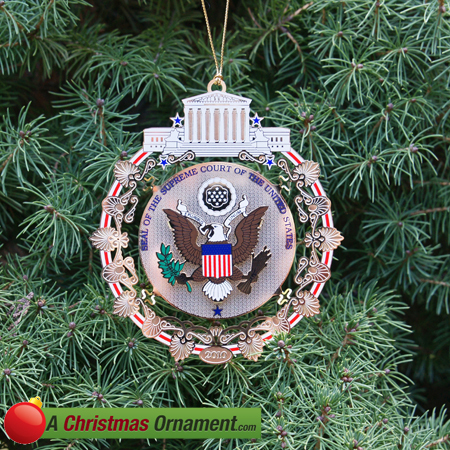 Christmas Ornaments Made in USA - 2010 Supreme Court Holiday Ornament - A Christmas Ornament Co. The Seal of the Supreme Court of the United States shows an Eagle with the motto, "E pluribus Unum" or "Out of Many, One". The Eagle is shown with an olive branch in one claw to depict peace and a set of arrows in the other. There is also a single star beneath the Eagle that symbolizes the Constitution's creation of the "one Supreme Court." The Supreme Court leads the federal judiciary and is the highest judicial body in the United States. The Supreme Court consists of the Chief Justice of the United States and eight Associate Justices. The Justices are nominated by the President and confirmed with the majority vote of the Senate.